Dan has been a part of the All Painting & Power Washing team since 2013. 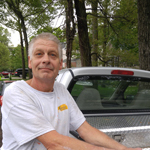 Even though Dan has been in the Painting industry for over 25 years, we started him out as a Painters Helper. That lasted just a couple weeks. Quickly him proved to us and our customers just how talented he really is. Even though he is willing to jump into every area of what we offer, interior custom painting is Dans specialty. When white ceilings meet a wall that has color, straight lines are always what Dan delivers. When walls need to be rolled out perfectly, Dan is there to make sure it happens. So when you hire us to have those rooms painted that demand the best, lets hope your lucky to have Dan as part of the crew.